LG brings Chrome OS to the desktop computer. 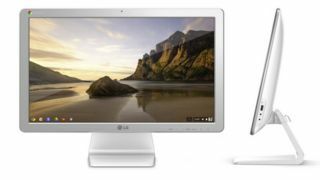 LG has introduced the first Chrome OS all-in-one desktop to the world, and it will be ready to be unveiled next month at CES 2014. The Chromebase has LG throwing Google's Chrome OS, which has only really appeared in fairly low-cost Chromebook laptops so far, into an all-in-one desktop computer. The 21.5-inch IPS Full HD display monitor will be powered by an Intel Celeron processor, 2GB of RAM and a 16GB SSD. The spec list may seem a little lacking, but LG has said that it is targeting schools and businesses like hotels and call centers, and with Chrome OS based on webapps, it doesn't need too much grunt anyway. And with an HDMI-in port that will allow it to still be used as a monitor, we imagine that the Chromebase will be able to act as system that boots up quickly for more simple, less power-intensive tasks while being able to be connected to a dedicated system for more intensive work. The Chromebase will also come bearing an HDMI-in, one USB 3.0 and two USB 2.0 ports, as well as its own keyboard, mouse, 5W speakers and a 1.3MP webcam. LG didn't hint at any availability dates or prices, and unfortunately, we probably won't get more than that until next month at CES. And now you can read our full LG Chromebase review!